↑ "Entrez Gene: GLIS family zinc finger 1". 1 2 3 4 5 6 7 Kim YS, Lewandoski M, Perantoni AO, Kurebayashi S, Nakanishi G, Jetten AM (August 2002). "Identification of Glis1, a novel Gli-related, Kruppel-like zinc finger protein containing transactivation and repressor functions". J. Biol. Chem. 277 (34): 30901–13. doi:10.1074/jbc.M203563200. PMID 12042312. 1 2 3 4 5 6 7 8 9 10 11 Maekawa M, Yamaguchi K, Nakamura T, Shibukawa R, Kodanaka I, Ichisaka T, Kawamura Y, Mochizuki H, Goshima N, Yamanaka S (June 2011). "Direct reprogramming of somatic cells is promoted by maternal transcription factor Glis1". Nature. 474 (7350): 225–9. doi:10.1038/nature10106. PMID 21654807. Lay summary – AsianScientist. ↑ Kang HS, ZeRuth G, Lichti-Kaiser K, Vasanth S, Yin Z, Kim YS, Jetten AM (November 2010). "Gli-similar (Glis) Krüppel-like zinc finger proteins: insights into their physiological functions and critical roles in neonatal diabetes and cystic renal disease". Histol. Histopathol. 25 (11): 1481–96. PMC 2996882 . PMID 20865670. 1 2 3 Pavletich NP, Pabo CO (September 1993). "Crystal structure of a five-finger GLI-DNA complex: new perspectives on zinc fingers". Science. 261 (5129): 1701–7. Bibcode:1993Sci...261.1701P. doi:10.1126/science.8378770. PMID 8378770. 1 2 3 Klug A, Schwabe JW (May 1995). 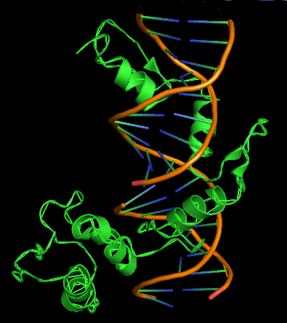 "Protein motifs 5. Zinc fingers". FASEB J. 9 (8): 597–604. PMID 7768350. ↑ Nakagawa M, Koyanagi M, Tanabe K, Takahashi K, Ichisaka T, Aoi T, Okita K, Mochiduki Y, Takizawa N, Yamanaka S (January 2008). "Generation of induced pluripotent stem cells without Myc from mouse and human fibroblasts". Nat. Biotechnol. 26 (1): 101–6. doi:10.1038/nbt1374. PMID 18059259. ↑ Takahashi K, Tanabe K, Ohnuki M, Narita M, Ichisaka T, Tomoda K, Yamanaka S (November 2007). "Induction of pluripotent stem cells from adult human fibroblasts by defined factors". Cell. 131 (5): 861–72. doi:10.1016/j.cell.2007.11.019. PMID 18035408. 1 2 "The Nobel Prize in Physiology or Medicine – 2012 Press Release". Nobel Media AB. 8 October 2012. ↑ Ralston A, Shaw K (2008). "Gene Expression Regulates Cell Differentiation". Nature Education. 1 (1). ↑ Boyerinas B, Park SM, Hau A, Murmann AE, Peter ME (March 2010). "The role of let-7 in cell differentiation and cancer". Endocr. Relat. Cancer. 17 (1): F19–36. doi:10.1677/ERC-09-0184. PMID 19779035. 1 2 Luger K, Dechassa ML, Tremethick DJ (July 2012). "New insights into nucleosome and chromatin structure: an ordered state or a disordered affair?". Nat. Rev. Mol. Cell Biol. 13 (7): 436–47. doi:10.1038/nrm3382. PMC 3408961 . PMID 22722606. 1 2 Okita K, Ichisaka T, Yamanaka S (July 2007). "Generation of germline-competent induced pluripotent stem cells". Nature. 448 (7151): 313–7. Bibcode:2007Natur.448..313O. doi:10.1038/nature05934. PMID 17554338. 1 2 Mochiduki Y, Okita K (June 2012). "Methods for iPS cell generation for basic research and clinical applications". Biotechnol J. 7 (6): 789–97. doi:10.1002/biot.201100356. PMID 22378737. ↑ Nakanishi G, Kim YS, Nakajima T, Jetten AM (January 2006). "Regulatory role for Krüppel-like zinc-finger protein Gli-similar 1 (Glis1) in PMA-treated and psoriatic epidermis". J. Invest. Dermatol. 126 (1): 49–60. doi:10.1038/sj.jid.5700018. PMC 1435652 . PMID 16417217. ↑ Wolf E, Lahm H, Wu M, Wanke R, Hoeflich A (July 2000). "Effects of IGFBP-2 overexpression in vitro and in vivo". Pediatr. Nephrol. 14 (7): 572–8. doi:10.1007/s004670000362. PMID 10912521. ↑ Nickoloff BJ, Qin JZ, Chaturvedi V, Denning MF, Bonish B, Miele L (August 2002). "Jagged-1 mediated activation of notch signaling induces complete maturation of human keratinocytes through NF-kappaB and PPARgamma". Cell Death Differ. 9 (8): 842–55. doi:10.1038/sj.cdd.4401036. PMID 12107827. ↑ Janda CY, Waghray D, Levin AM, Thomas C, Garcia KC (July 2012). "Structural basis of Wnt recognition by Frizzled". Science. 337 (6090): 59–64. Bibcode:2012Sci...337...59J. doi:10.1126/science.1222879. PMC 3577348 . PMID 22653731. ↑ Song W, Chen YP, Huang R, Chen K, Pan PL, Li J, Yang Y, Shang HF (2012). "GLIS1 rs797906: an increased risk factor for late-onset Parkinson's disease in the Han Chinese population". Eur. Neurol. 68 (2): 89–92. doi:10.1159/000337955. PMID 22759478.